Freedom! As today was Saturday, we had no clinic and no prearranged tours for once. I was starting to have a stuffy nose and a bit of a cough after being so wet and cold a few days before, but wasn’t about to spend my free time in China in a hotel room. Some of the elements in our group felt that shopping for electronics should be at the top of our to-do list. Curious, and still slightly nervous about getting lost if I went shopping alone, I tagged along. We took the subway to get to the electronics district and I have to say I was impressed. The subway was probably the cleanest public area we’d seen yet, done out with gleaming steel and big fanciful works of art that were unmistakably Chinese, yet modern. To ride, you bought a plastic token at a touch screen that showed all the stops on an interactive map. Then you touched it to another screen to get past the turnstile and onto the platform. At the end of the ride you finally fed it back into another turnstile to get out, so I was worried I would lose my token and be trapped in the subway forever. The train platform was clean with brightly colored dragon motifs in different colors above the doors to the trains. Trains seemed to run about every five minutes and were full but not uncomfortably so. I wondered what rush hour would be like though. After a short ride we arrived in a part of town I didn’t recognize. I have to say, there is nothing like an underground train to make me feel like I have no idea where I am. Emerging into the bright sun light, we set off past a bakery with tasty looking things in the window and down a street lined with tiny shops. One member of our party had lived in Beijing a few years before and was quickly disappointed by how much prices had increased since then. Not for the first time, I thought that it was a good thing I had come to China now, because at the rate it changes the experience will probably be totally different in a few years. Eventually we found some speakers and miscellaneous electronic goodies and decided to go back to the Confucian Temple Market, Fu Zi Miao. It was a bit far to walk and the subway didn’t come out very close either so we opted for some motorized open air “taxis”. These were a sort of cross between a motorcycle and a dune buggy. We didn’t all fit in one, so we raced through the streets in a pack of these odd little vehicles, our Chinese drivers weaving in and out of traffic. I felt naughty riding on one without a helmet or seatbelt; It was a lot of fun. At Fu Zi Miao the streets were busy with people shopping and taking pictures. One of the more popular photo ops was a big fake tree I came to think of as “The Money Tree”. 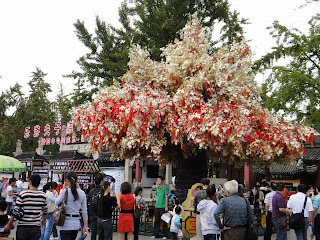 It was festooned with golden leaves and red ribbons painted with Chinese characters. What the ribbons said was somewhat unclear, but I think they were blessings or wishes. Sometimes, we saw people throwing more of them up into the tree. You could also buy a blessing by making a donation to the temple staff. They would come up and give you a slip of paper or a trinket that had your zodiac animal on it. Then they would show you a donation log and frown and shake their heads if you didn’t offer enough money. I didn’t make a donation, but some people did. It is a nice enough temple, but many of us didn’t even go inside, being more interested in the surrounding market. The temple proper cost more money to visit and I think we had had our fill of temples on our previous tours. 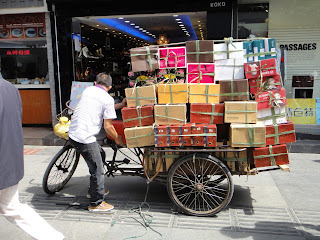 We were content to explore the side streets of Fu Zi Miao, which are reserved for pedestrians only and pack in more commerce than you can shake a stick at. You can buy anything from shoes to live turtles to giant jade sculptures and that’s not even getting into the food. Many stores I wandered past sold similar goods, but there were some legitimately beautiful works of art there. 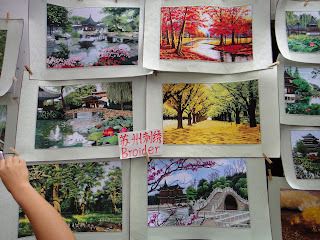 I particularly admired some of the needlework or “Broider” as the sign next to it proclaimed. I was afraid to stop and stare for long though, because the salespeople would get excited and start trying to sell me things. Saturday must have been their re-stocking day too, because there were all manner of bikes and bike trailers loaded down with boxes. My favorite picture was of the shoe delivery guy, who puts Santa to shame if you ask me. Apparently SUV’s look a bit different in China. 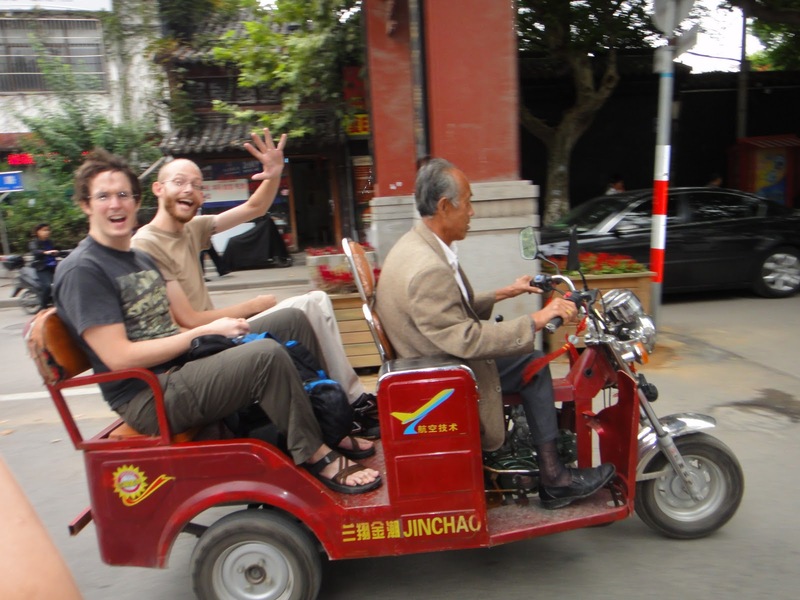 After Fu Zi Miao, we were not sure how to get home, so we caught some taxis and showed them our hotel card. 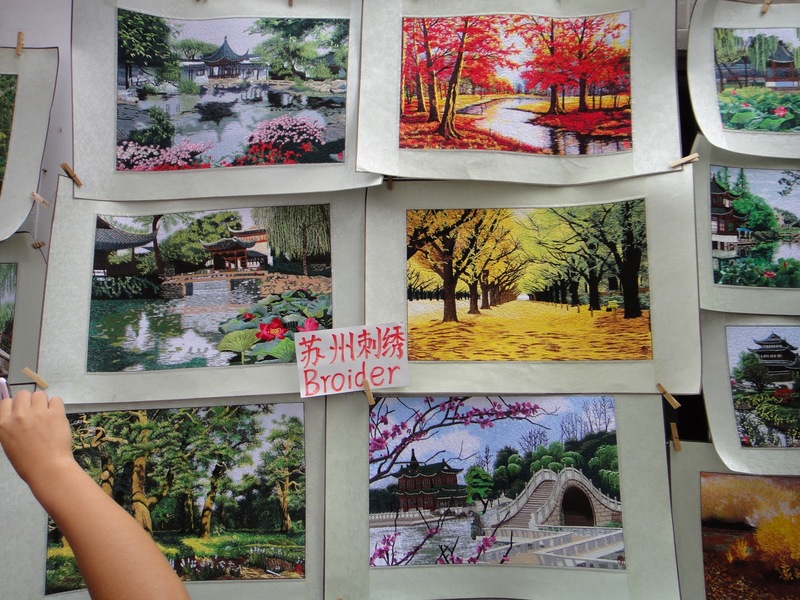 It cost just 9 yuan to get back, and split three ways that was less than 50 cents each. Awesome! I was starting to feel really congested in the lungs by that time though, so I went with another friend to get cupping done at what was becoming our regular tuina massage place. In the states I had mostly had sliding cupping with just two cups, but today they used pump cups instead of fire cupping and put them all over my back instead of moving them around. My friend had had back pain, so she got cupping for that as well. The marks were pretty spectacular when we were done but we both agreed we both felt better. For dinner we went back to eating Chinese food at a little place by the hotel . My favorite thing was the “hollow heart vegetable”, something I had never had or even heard of before. It was the usual struggle to find dishes that the vegetarians could eat. The attitude in China is that if you go out, you want to eat meat to impress your guests. Tofu is something you eat with meat and not instead of meat, so often the tofu dishes have meat in the sauce. Needless to say there is no vegetarian section on many menus. Customs around eating are just different in general. Usually only one person pays for the whole meal and you fight over the bill. In our group we just fought over the vegetables and split the bill. Americans, what can you do with them?